How can I even begin to describe the magnitude of LCD Soundsystem? They are one of the most relevant bands of the past decade, probably even of our generation (even Pitchfork has to agree). LCD Soundsystem has played a crucial role in helping define a sound that began as “dance-punk” but quickly transformed into the self-aware, electronic indie rock that few other bands can even touch. I was fortunate enough to catch one of five of the band’s last ever live performances. Initially heartbroken at my inability to get a ticket to the final stadium arena show that somehow sold out before tickets went on sale, I ended up completely satisfied seeing James Murphy and the crew in a smaller venue. Our decision to attend the March 29, 2011 show was strategic: all the bugs of the first night would be worked out, while the band was still riding the adrenaline rush of playing a week of sold out shows to adoring fans. This show was special in that it was lead singer James Murphy’s sister’s birthday, which made the entire audience feel closer to both the man and the band that has earned a spot as a trusted favorite of most. The overall experience was an introspective dance party: intimate but loud, cozy but sweaty, filled with friends and strangers. The same weird, loveable wonkiness that has guided the band defined their performance. Sound corny? It is, but when you’re talking about the end of an era, it’s hard not to get nostalgic. This nostalgia is completely justified. LCD Soundsystem is one of the few bands I’ve ever listened to that creates truly unique music about traditionally cheesy things, like growing up and going through heartbreak. Two songs in particular, “All My Friends” and “Someone Great”, revolve exclusively around these deep subjects about the change from wasted youth to “becoming an adult” in the way that is usually reserved for only great works of literature. From the moment LCD Soundsystem opened what became a three-and-a-half hour long set with 2010’s This Is Happening recent single “Dance Yourself Clean”, I knew I was in for the show of a lifetime. The band literally played every single one of my favorite songs in those three hours. I know that might sound crazy, but LCD knew exactly what we wanted to hear and created three distinct sets showcasing all the talent of a decade-spanning career. The first set took the audience through the kind of heart-thumping, crazy, loud music that makes you first pay attention to the genius of LCD Soundsystem. Beyond dressing in almost entirely all white, there was a male choir that backed Murphy’s screams, shouts and long notes for major songs like “Dance Yourself Clean” and my own personal favorite, “Get Innocuous”. The choice to include the choir on those power songs made perfect sense, as it highlighted what LCD does best: taking the listener through increasingly layered beats that each climax in danceable moments of joy. Somehow, these songs make legitimate boogieing cool again while significantly commenting on what it means to be a human in our postmodern world. Their second set was almost entirely from 45:33, a lesser-known album originally commissioned by Nike back in 2007. The point of this album was to perfectly accompany a great workout, which is kind of odd considering indie electronic bands are not typically associated with running. The album is not one of my favorites by any means, but I appreciated how it let the other LCD superstars get the attention and recognition they deserve. The band generally revolves around Murphy and his social life, interviews and general antics, so it was nice to see guitarist Al Doyle, keyboardist Nancy Whang and especially drummer Pat Mahoney really let loose in this instrumental hour. I also enjoyed when the band brought out NYC-based comedian and musician Reggie Watts to provide backing vocals to a very funky “45:33 Part Two”. 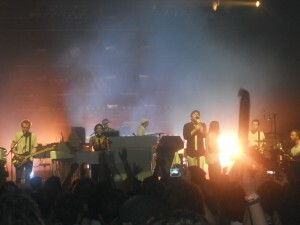 A welcomed break from this middle set was “Sound of Silver”, the title track off the band’s 2007 masterpiece. The third set included more of the crescendo-building dance-punk-release songs that are exactly what I love about LCD Soundsystem, the biggest highlight of which was “Us v. Them” with the male choir. But the true March 29 show-stealer was the band’s encore. LCD Soundsystem might be the band most heavily associated with underground New York City in the 2000s (The Strokes being the single exception), so it was only fitting that the encore would reflect upon the inevitable relationship that people who live here long enough come to have with this place that simultaneously inspires so much love and hate. “New York I Love You, But You’re Bringing Me Down” was sad but playful, beautiful and danceable, the very last song in an absolutely awe-inspiring set. I couldn’t have imagined it any other way. This entry was posted in Arts, Culture, Featured, Music and tagged 45:33, LCD Soundsystem, New York City, Sound of Silver, Terminal 5, This Is Happening. Bookmark the permalink.